Want to awaken your psychic senses? Feeling the need to tap into the endless well of ancient knowledge? 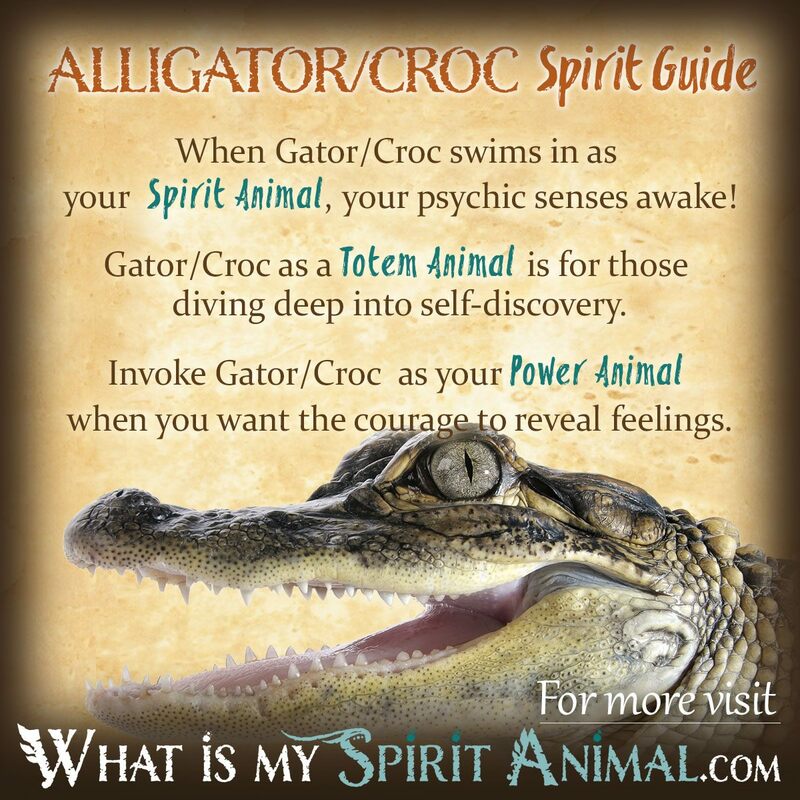 Alligator as a Spirit, Totem, and Power Animal can help! Alligator teaches you how to tune into your innate skills! 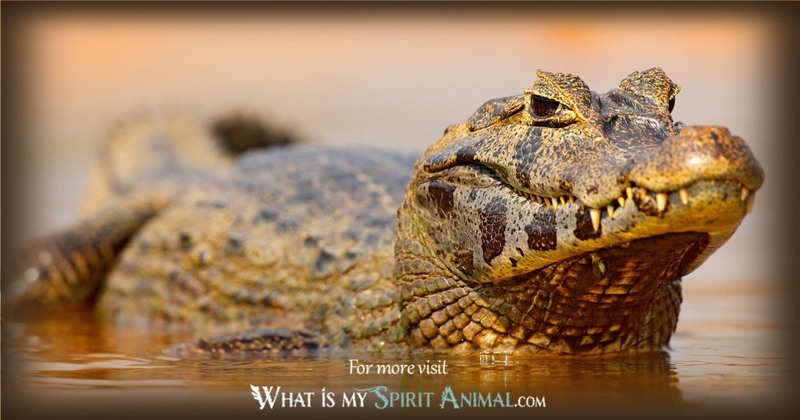 Delve deeply in Alligator and Crocodile symbolism and meaning to find out how this animal spirit guide can support, strengthen, and inspire you! It is extremely hard to tell an Alligator from a Crocodile, which is why their symbolism and meaning overlap. These are ancient creatures – forceful and strong. Ancient beliefs hold the Alligator and Crocodile protect ancient knowledge and wisdom that reaches back to our primal DNA and beyond. Lightworkers tell us that Alligator has a close affinity to the Earth Mother in that this spirit also protects those under its guidance. Crocodile is not easily fooled and brings a lesson of patience, particularly during new beginnings. Alligator and Crocodile both live in two domains – that of Earth and Water. They often use the areas in between (mud) as a way to conceal themselves when hunting. Note however, these Animal Spirits do not simply consume for fun – they eat when necessary, moving slowly and surely, wasting nothing; this provides these creatures with the additional symbolic value of frugalness. Life offers us all manner of “soul” food, and we need to take our time integrating it. One of the interesting defining characteristics of Alligator and Crocodile is that their eyes are on top of their heads. Metaphysically this implies the gift of sight – perhaps future-telling, clairvoyance, the ability to see Angelic spirits, etc. This wonder of nature is why it’s hard to spot these animals before they strike. They use their eyes to see without exposing themselves to danger. Alligator and Crocodile both work with water energy, which represents our emotions particularly those we hide from the world. Alligator Medicine works toward embracing those feelings and working through them honestly. All humans have an inner well of wisdom combined with the collective unconscious that guides us through this process with the Crocodile Spirit standing by ready. Baby Crocodiles and Alligators are very vulnerable. Their mother must hunt for them leaving the nest open to predators. So, if you are feeling very small, Alligator may come to you delivering a warning that you need to find a secure shelter, physically, emotionally, or spiritually. In the wild, Alligator and Crocodile exhibit marvelous parenting skill. But when hunting the mother stays on vigilant watch over her nest for nine long weeks until the babies hatch. At this point, she moves them into the water where they can easily feed while remaining close by. Young Alligators have been known to stay with their mother for up to 12 months, giving this Animal Guide the additional meaning of nurturing and cultivation. Special Note: Many would argue that reptiles and amphibians are intelligent or sentient. In the world of psychology we hear about the Reptilian Brain. Supposedly it’s the part of the brain that controls dominance, survival, and instinct. Mostly, it’s thought of as the ‘lower’ or ‘base’ part of human action. But all over the world there’s compelling evidence that reptiles and amphibians are capable of love and bonding with humans. “The Man Who Swims with Crocodiles” is one such story. Other common associations for Alligator and Crocodile include individuality, sagacity, motherhood (Goddess energy), survival, psychic awareness, endurance, and the Power of the Ancients. When Alligator / Crocodile begins showing up in your life, you will likely be presented with a new opportunity that truly energizes you creatively. The message of Alligator is one of seeking the knowledge you need to grow and transform; this doesn’t happen overnight so be patient with yourself. It is a time of initiation. When you emerge from Crocodile’s tutelage, you with have far greater insights and spiritual aptitudes, so much they may surprise you. You will need time to honor these new gifts and abilities. 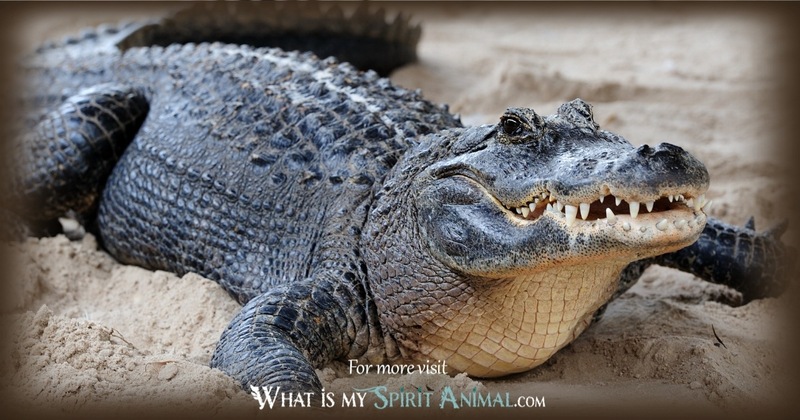 Meditating near water often helps tap Alligator Spirit’s insights, especially those dealing with your own psyche and emotional traumas that may be a little uncomfortable, but require resolution. Remain fearless and strong. Alligators and Crocodiles are watchers. They stay hidden in the depths until the time is right to emerge. When these reptiles present in your awareness it’s time to submerge. Step out of the line of sight. Consider what and who you really want in life. Observe. Take in your surroundings. Communicate with your Gator and Croc Spirit Animal. Ask to be shown the perfect time to come up for air and swim toward all you desire. Those born with an Alligator / Crocodile Totem are fierce workers. You strive for success and abundance while remaining true to your vision and voice. This Totem brings out intense emotions that others can see quite clearly. People will never have to second guess you or wonder about your intention. The Alligator / Crocodile Totem brings out the inner healer, artist, and eternal student. You seek after knowledge with an unquenchable thirst, particularly in the areas of history and spirituality. The amount of data you accumulate in all your lifetimes is accessible to you here and now, but nibble on it slowly, so it doesn’t overwhelm you or others. Seek out Alligator / Crocodile when you struggle with maternal instincts or the overall cycle of life. This Animal Spirit helps during times of illness and recovery, especially when dealing with difficult emotional matters like depression. 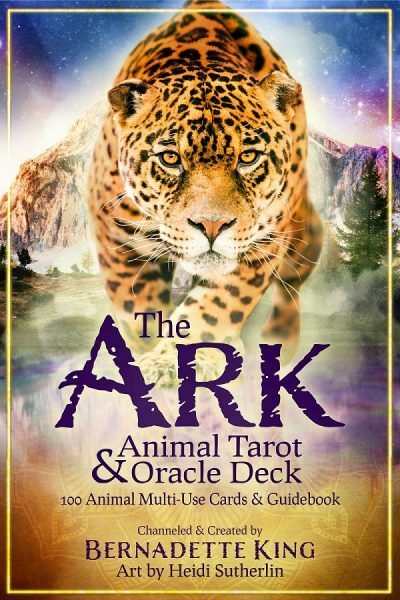 Those seeking an awakening of psychic abilities will find assistance from Alligator; this guide shows you the ebb and flow of energy and how to understand it while remaining in balance. Invoke Gator and Croc medicine and energy when you need patience. Call on these reptiles when you need the courage and stamina to go after what and who you want. Also, reptiles and amphibians tend to be misunderstood and feared. Fortunately, that is changing as the world learns more about how loving and fun these creatures can be. If you feel misunderstood, Alligator and Crocodile as a Power Animal can offer spiritual strength to help support you during times of loneliness. In Native American folklore and mythology, Alligators are shown as a villain who is easily outsmarted by other Animal Spirits. The only region where Crocodile plays a more positive role is in the South East where he treats humans to hunt responsibly. Some tribes trace their ancestry to Alligators, while others, like the Seminole, include an Alligator dance among their sacred rites. 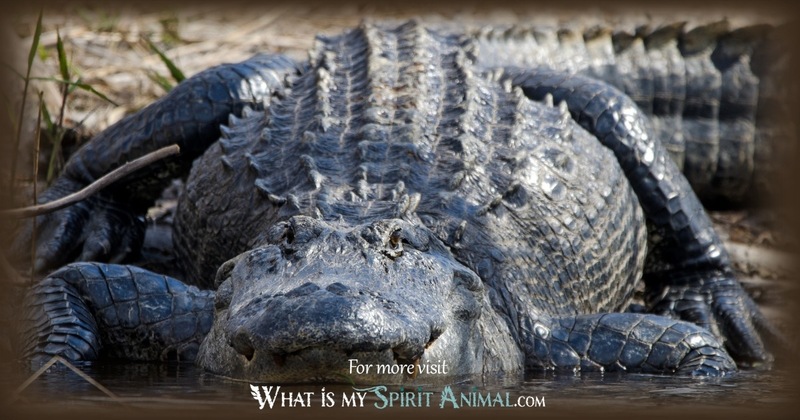 Learn more about Alligator Spirit in dreams by reading What Does Dreaming About Alligators Mean? 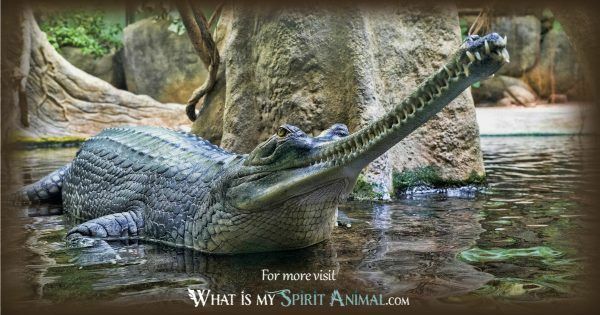 or access more information on Crocodile Spirit by reading What Do Crocodile Dreams Mean? on WhatIsMySpiritAnimal.com! In Mayan Astrology, the Alligator / Crocodile represents a new start. It is the first Day Sign. Known as the Imix, those born under the Alligator are manifest machines. They love taking on new projects and use your vision to create an atmosphere of cooperation. You will forcibly protect what you begin and care deeply for those you love. Stories tell us Crocodile Spirit lives beneath the ocean carrying the world on his back. The Imix brings wisdom, psychic insights, and the power of creation. The direction associated with Crocodile is the East, and the creature’s sacred stone is red jasper. In the Far East, Crocodile resided along the Yang Tze river bank. She became known as a rain-bringer as they emerged from the mud during the rainy season as if summoned by thunder. Some believe stories of Dragon are actually based on Crocodiles.